Meeting with Maori residents of Hawaii, 1920. AUDIENCE WITH THE MAORI AT THE HOME OF MRS. A. P. TAYLOR. In the uplands of Manoa, at the home of Mrs. A. P. (Ahuena) Taylor, at “Luana Pua,” an audience was held to honor the Maori of New Zealand [Nu Kilani], living in this town; and attending were many Hawaiians, where they spent a long time, last night, meeting with the malihini, while they compared the old Hawaiian stories with that of the Maori people. This is the second time which the Maoris appeared at the home of Mrs. A. P. Taylor, on that night, because of the desire of these malihini to have proper time for them to meet and discuss with the descendents of the important families of Hawaii nei. Present were the descendents of the line of Kamehameha and Kalakaua on that night, there also were some kamaaina who had a deep understanding of the history of the Hawaiian people, to satisfy the desire of the malihini. Within Mrs. A. P. Taylor, as well as in all of the people who gathered there last night, was the wish to find the genealogy shared between the Hawaiians and the Maori people, and that it be in accordance with the stories memorized by the Maori; and it is their true belief that the Maori came from the Hawaiians by Hawaiians travelling to New Zealand. This night was spent with talking between the malihini and kamaaina, as the crowd was entertained by singing, while light foods were passed before all who were invited. Amongst those present at this meeting was: Princess Kawananakoa, Kaukaualii Stella Keomailani Kea, Kaukaualii Kekaaniau Pratt, Judge S. B. Dole, Mrs. Mary Jane Montano, Edwin Kea, Kaukaualii Lucy K. Peabody, Mr. and Mrs. E. Henriques, Mrs. E. M. Nakuina, Mrs. Irene Holloway, Mrs. K. Hutchinson, Misses Lani Mercy and Misses Lani Hutchinson, Mr. and Mrs. K. Beckley, L. Beckley, G. H. Beckley, Mr. and Mrs. M. Kahea, Mr. and Mrs. W. K. Taylor, Miss Mabel Taylor, Mrs. E. Straus, Mrs. K. Kali, Mr. and Mrs. J. C. Lane, Mr. and Mrs. C. Maertens, Miss Anna Maertens, Mrs. E. M. Foster, Mr. and Mrs. I. R. Burns, Mr. and Mrs. H. Afong, Mrs. J. M. Riggs, Col. and Mrs. C. P. Iaukea, Mr. and Mrs. M. Ahia, Mrs. N. Mahelona, Misses Mahelona, Mrs. M. Wilson, Mr. and Mrs. D. Hoapili, Jr., Mr. and Mrs. A. K. Hoapili, Miss Hoapili, A. Hoapili, K. Hoapili, G. Kealohapauole, Mrs. K. Mahoe, Mr. and Mrs. Hans Gittel, Mr. and Mrs. W. Simerson, Mr. and Mrs. Isaac Harbottle, Rev. and Mrs. S. Kamaiopili, Mr. and Mrs. E. Boyd, Mrs. K. Wallace, Judge and Mrs. A. G. M. Robertson, Mr. and Mrs. Chillingworth, Mr. and Mrs. S. Chillingworth, Jr., Mr. and Mrs. F. Hons, Mrs. Lahilahi Webb, Mrs. E. S. Cunha, Miss Irene Dickson, W. A. Beckley, Mr. and Mrs. J. Kamanoulu, Mrs. J. H. Wilson, Rev. Akaiko Akana, Mrs. Niau Iaukea, Mrs. S. Parker, Mr. and Mrs. Robt. Hind, Miss HInd, Miss Mary Low, Mr. and Mrs. Eben Low, Mrs. Hannah Paris, Mrs. Caroline Robinson, Miss Kathleen Ward, Miss Lucy Ward, Miss Kulamanu Ward, Mr. and Mrs. Hanohano, Mrs. K. Bishaw, Mr. and Mrs. C. Long, Mrs. Lewis, Mrs. Mana, Mrs. Myra Iona, Mr and Mrs. E. W. Burgess, Mrs. P. Phillips, Mrs. M. Fernandez, Mrs. Edwin Fernandez, Rev. and Mrs. Maikai, Mr. and Mrs. M. Robinson, Mr. and Mrs. C. F. Peterson, Mr. and Mrs. E. P. Irwin, Mr. and Mrs. D. Peterson, Mr. and Mrs. W. A. Cottrell, Mrs. Hilda Techera, Mrs. Kamaka Stillman, Mr. and Mrs. Cushingham, Mrs. Ellen Dwight, Misses Holt, Mrs. C. W. Spitz, Mrs. T. B. Walker, Mr. and Mrs. Constable, Captain and Mrs. W. E. Miles, Mrs. Victoria Buffandeau, Mr. and Mrs. W. Paikuli, H. L. Holstein, Carl Widemann. 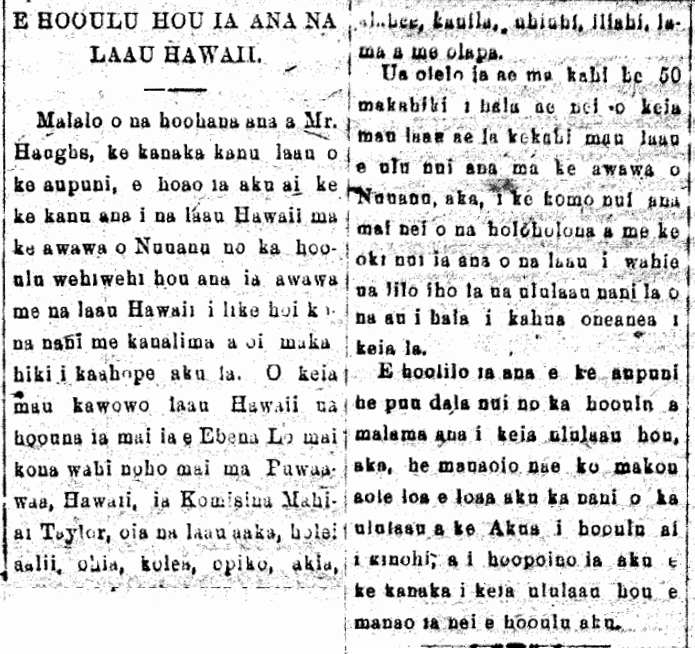 Ka Nupepa Kuokoa, Buke LVIII, Helu 24, Aoao 4. Iune 18, 1920.